"This strawberry freezer jelly is quick, easy and delicious on toast, ice cream or even in milkshakes! 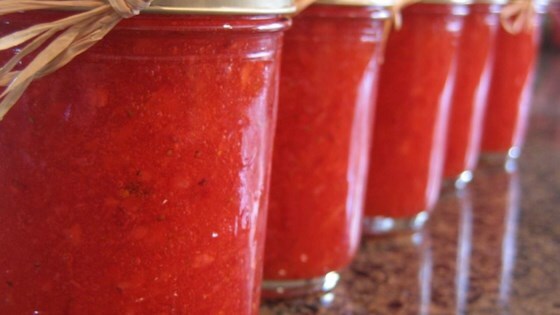 Keep jars of this in the freezer and take them out when you are ready to use them. Once thawed, they will last approximately 1 month in the refrigerator. If it lasts that long!" Holy fricken sugar! This recipe was way too sweet..The recipe on the box of pectin that I used said to use 1/2 as much sugar for the same amount of fruit, so I'll probably try that next time. I used the low-sugar Sure Jell (changes: 4 c. fruit, 3 c. sugar), and the recipe is AWESOME. It makes me wish I had vanilla ice cream in the freezer! RE-measure the strawberries after you smash them. I didn't realize that I was supposed to do this the first time, and I ended up with too many smashed strawberries. I'm sorry, but this had WAY too much sugar for me. Next time, should I try this again, I'll add a cup of strawberries and lose a cup of sugar.